The man cave. The idea has been corrupted by male comedians making jokes about nagging wives, but no one can argue with the concept that every person, male or female, needs a space where they can be alone (or with their buddies). Today, let’s talk about the men. The way we see it, there are four basic themes that a man cave usually takes. There’s the theater room, the garage workshop, the home bar, and the game center. Most of the time, a man cave will take its inspiration from one of the four, and then mix in the man-in-question’s favorite aspects of the others. Let’s take a closer look at each. 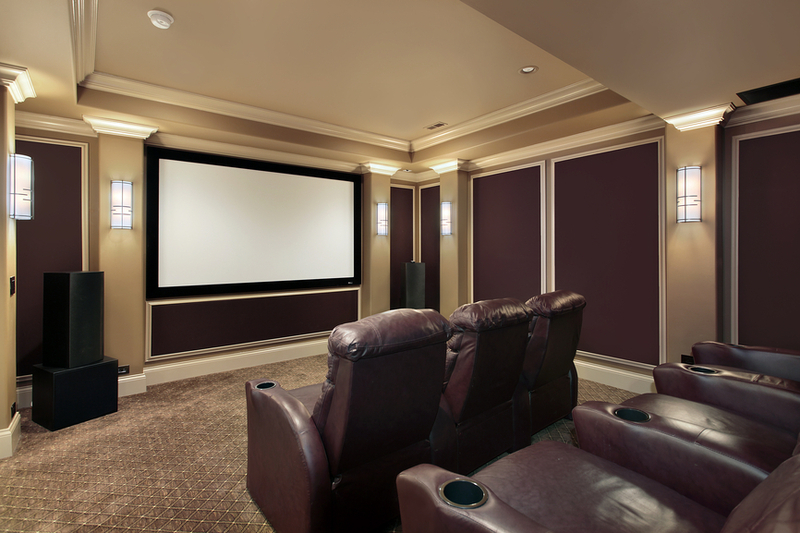 The Theater Room: The theater room is typically a room modeled after a movie theater. Seems simple, right? It requires some chairs and either a very large flat-screen TV or a projector system. Well, it can be a bit more complicated than you’d think to organize an effective theater room-style man cave. Organizational factors to consider: An ideal theater room will have a row or two of comfortable—maybe even reclining—chairs that face the screen. Make sure you have a good place to store your remotes (not to mention a home bar setup to hold your snacks and beverages)! We also recommend built-in cabinetry around your TV to hold your movie collection, as well as lights with a dimmer switch to set the mood. The Game Center: A spin on the theater room concept, the game center allows for a wider variety of entertainment options. This might mean a setup for game consoles and music or even larger games like billiards, foosball, or darts. In the game center man cave, space is often at a premium. Organizational factors to consider: Wires. An ideal man cave will be free of the unsightly clutter that wires bring to the room. At Strickland’s we specialize in designing perfect built-in cabinets to match your room and tastefully hide your equipment, wires, movies, and games. The Garage Workshop: every handyman’s dream! It’s important for any tinkerer to have a clean, accessible workbench with sufficient room for all his storage needs. That means sturdy, custom cabinetry, designed specifically for your tool and space requirements. Organizational factor to consider: Equipment. What kinds of projects do you do? Strickland’s offers a wide variety of garage workshop accessories to keep your space neat and organized. The Home Bar: The home bar is a man cave staple, one that pairs nicely with any of the other man cave options (except maybe the garage workshop!). Often called “beverage centers,” the home bar can be custom designed to fit your needs and space. Organizational factors to consider: Do you need cabinetry to conceal a mini-fridge, as well as shelving for glassware storage? Based on your taste, Strickland’s offers opened or closed cabinetry and shelving, as well as custom-designed wine racks and fridge storage. Ready to hide away in your own personal man cave? Stop by Strickland’s showroom today to speak to an expert about all your design and organizational needs, and we’ll help you get started!